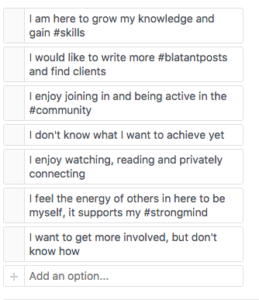 #community – what does it mean to you? 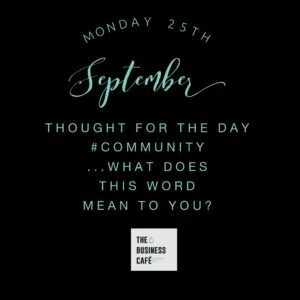 Thought for the Day #community – what does it mean to you? It constantly occurs to me that my desire to build community is a deeply ingrained desire, driven by emotion and fired by desire to connect and build family. In my Thought for Today, I wanted to explore what it means for you. The role one plays in a community is a unique one, as Brian on ‘Life of Brian’ states “we are all individuals“, and so how a community serves you, or you serve it is entirely personal. The culture of a community is created together. Through shared values and beliefs. As I know too well from my past, protecting that culture is critical. I have experienced an online community getting so large that it had the normal dangers of life offline. Intimidation, fear, anger and upset. It is hard not to attract the negative with the positive, someone once told me that people with negative energy have to recharge their battery cells by being within the positive. How sinister is that. So, as we build this culture, all of us together, FOR all of us, we need to decide what citizen we are in order to gain the most from it and not judge it’s ROI unless we judge ourselves and understand our own part. Within any community we join, on and offline, we cannot really be passive. But we often are. I have lived in Farnham for 27 years and enjoyed the restaurants, shops and calmness, it is only recently that I have had the mindset to visit the Church and volunteer for community events. Yet, I am incredibly active in other communities. All communities have around 10% that are active, 90% that show up and enjoy observing, walking around inside the virtual walls, smiling at people (in the online world that is a LIKE, and they are valuable, just for being there, and in fact, might have loads of private chats with members, but don’t want to openly contribute, perhaps not confident yet, perhaps fearing the time once they put their hand up and right a post. Everyone in a community has value, even in Farnham, I have had value, I have spent a lot of money in shops and restaurants over the 30 years, paid my rates and smiled a lot as I walk through the streets. My value may have been commercial but hey, lets now knock that, we like someone who wants to hire our services and spend money with us. Hence our #blatantpost idea, we want you to gain clients and suppliers while you walk the streets on The Business Cafe Global online group here. Can you help me then, another poll, while we all learn more about this community we visit most days. Also your comments will help us learn how to best serve you. Have a great day everyone, thank you for being a citizen of this community. We appreciate you enormously.